Online Boxing Timer is a free online boxing timer you can use from any computer. It is fully configurable to your desired settings. 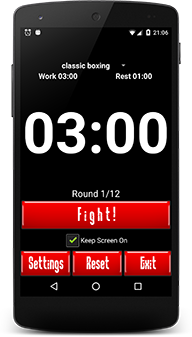 Use Online Boxing Timer as a timer for any round sport like boxing, MMA (Mixed Martial Arts), Muay Thai, wrestling or any other round timer uses. Press the set-up button, and select the mode button for the component you want to set. Press the up or down arrow to change the value of the component. You can set rounds, prepare time, round time, warning time, and rest time. When done, press the finish button. Rounds: The number of rounds in your session. Prepare: The preparation time before your session begins. Round: The time for your active/work time in your session. Warning: The time to give a warning sound that the round is about to end. Rest: The inactive time between rounds for rest. - To begin your session press the "Start" button. - To pause your session press the "Pause", and to resume press the "Resume" button. - To Stop your session press the "Stop" button. This application is designed to control time during interval training in various kinds of sport from martial arts (boxing, karate, Muay Thai, MMA) to swimming, jogging, CrossFit etc. The application will become your best home workout helpmate. It has got a wide range of features. This application is used by a professional coach Armando Guzman from "Lite-It Up Boxing" Team and a lot of champions in his gym. So, I got the free version, set up a bunch of profiles and really came to love the app. I used it a few times, decided to support the developer and went for the paid version. It's the right thing to do and so long to those irritating ads. Unfortunately, when you make the switch from free to paid, your profiles don't come through. That's a lot of tinkering, adjusting and contemplation lost along the way. It's a small point, but a rather relevant one, if you happen to spend a lot of time setting up profiles. Beyond that, this is one fine app. I've experimented with a few, and so far only this one allows you to customize individual rounds so deeply. The option to change the rest time per round is sweet. 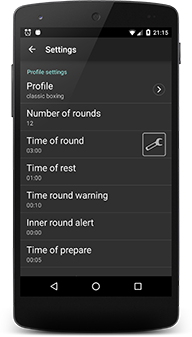 Good sound options, too, and this is the only app I've come across that has the vintage CLACK, CLACK, CLACK to warn of the final ten seconds of a round. I think the developer should add the voice of Mickey growling, "YOU'RE A TOMATO!" for those days when you just can't get through your heavy bag workouts. Although, the option to add our own sounds is there, so maybe I'll add it myself. Great app. Super Timer, man kann alles toll einstellen. Awesome Boxing Interval Timer App is awesome. Well designed, with bright colour screen backgrounds for fighting round modes, resting, etc. Figures nice, big and bold for use on phones. Love the genuine bell sounds at start and of rounds and voice. Easy to change settings, great layout especially when phone is vertical / horizontal. App is also good for things like Tabata cardio workouts, etc. Sleek, simple, versatile and brilliant. Единственный нормальный таймер Функционал и удобство пользования на 5+, особенно в ландшафтной ориентации- большие хорошо читаемые цифры, кнопки прячутся. Пришлось целую кучу разных таймеров установить в поисках лучшего. This application is designed to control time during interval training in various kinds of sport from martial arts (boxing, Muay Thai, karate, MMA) to swimming, jogging, CrossFit etc. The application will become your best home workout helpmate. It has got a wide range of features. You can try using some basic features of this application on our website. But as it's only a web-version, it doesn't show all the features included, so we suggest installing the mobile version (Android or iOS). It's convenient to use in a gym, in the street and wherever you want and need it. Stop and start the timer without taking off boxing gloves or any other equipment using vibration and proximity sensors on your phone. We are the team of positive and fit guys. We do various sports (including boxing), so we know what you need to optimize your training process. And we do our best to include the most needed and useful features into our applications. Some of these features have been added thanks to our users’ feedback. So your offers and suggestions, as well as critical observations are always welcome. Feel free to contact us or send your feedback! Thank you for your attention! We wish you very productive workouts!